The island of 600 is now home to 1.4 megawatts (MW) of solar energy generation capacity (5,328 SolarCity solar panels) and 6 megawatt-hours (MWh) of energy storage capacity (60 Tesla Powerpacks). Notably, the project took less than a year to develop and implement. Previous to the solar photovoltaic (PV) + energy storage installation, the island of Ta’u had been reliant upon imported diesel fuel, as many small islands are — not a cheap situation to be in. So, while a combination of solar PV and energy storage isn’t exactly cheap at this point, it is often a very good choice for small island communities (if initial funding can be found). In this case, funding was provided by the American Samoa Economic Development Authority, the Department of the Interior, and the Environmental Protection Agency. 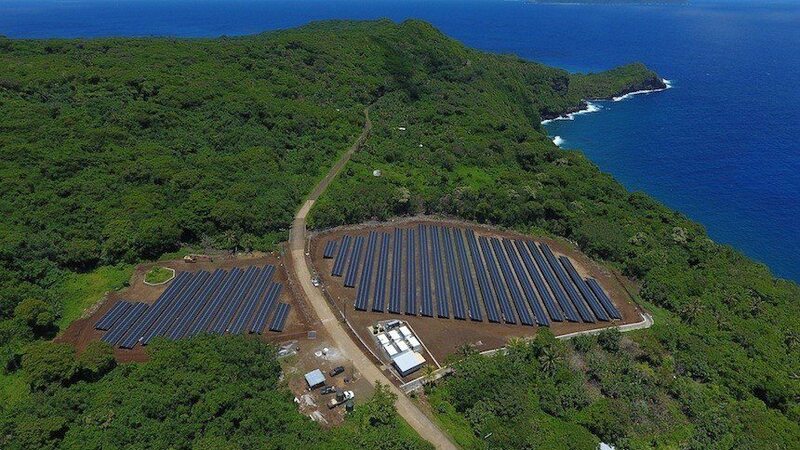 According to Tesla and SolarCity, the newly created island microgrid allows for 24/7 electricity availability — with no power outages and no bottlenecking.